Omelette was on the menu for the young people, and trout for the Pope. But the Holy Father declined the offer because he felt it would be too complicated to eat fish and speak at the same time. 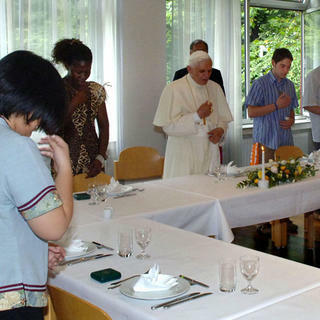 So Benedict XVI was served an omelette and nothing stood in the way of communication; not even the variety of languages spoken by the diners, because on top of everything else, the Pope proved to be an excellent interpreter. More from the lunch here.